RP17454CB is rated 5.0 out of 5 by 2. Rated 5 out of 5 by MrGuaitiao from Long Lasting I have two Delta Pull Down Spout that I installed back on 1994...they still working perfectly... I have newest models of spouts from this an other manufacturers in another houses that I have decided to replace them withe the RP17453...no issues with these models for even the finidh still intact.. I purchased this item as a set. It is a 3-handle tub and shower set. How can I find the complete set number? I am replacing RP7533 discontinued spout. Will this spout thread on the old adapter or do I need to change it? Thank you for your question. 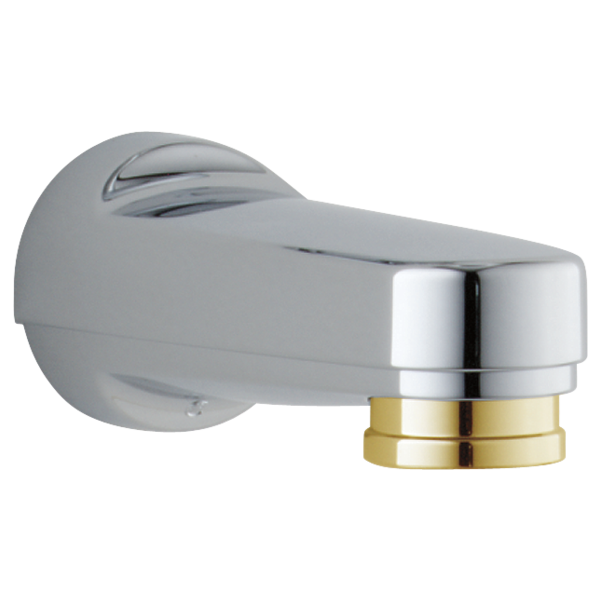 Delta Faucet model # RP17454PB is a metal tub spout. It's called a Pull-Down diverter.... which part do you pull down? Hello Goober, Thanks for your question. Sorry for the confusion. The ring around the tip of the spout pulls down to activate the diverter. I currently have the RP5833 spout. I would like to replace it with the RP17454 spout. Will this involve changing the length of the pipe extending from the finish wall? Is there a strainer in this spout? If not, is the downspout removable? Thank you for your question. Delta Faucet model # RP17454 could either have been sweated onto a copper pipe or threaded onto an iron pipe when it was installed. It may just screw off to flush the lines but it does not come apart. If you do get if off, you might try soaking it in a 50/50 solution of white vinegar and cold water to loosen any mineral deposits. My tub faucet has a 1&quot; threaded pipe coming out of the wall. It extends 5/8&quot; from the finished wall. Obviously the included adapter is for a 1/2&quot; threaded pipe. Can I use the RP17454 faucet with another adapter? What options do I have to use this faucet? What is the difference between this model and 17453? How would I know which one I need?